Olive oil skin health benefits are sought after and have quickly become an essential anti aging treatment. Olive oil has always been known for its healthy nutritional value in cooking but many people are rediscovering how it can be used to maintain our skin health. This amazing natural oil was used as an ancient remedy for skin care therapy and is still beneficial today because of the abundant amount of antioxidants found in olive oil. Olive oil is rich in antioxidants that work to neutralize free radicals. Free radical damage can come from numerous environmental hazards such as sun damage, pollution, and smoking. The vitamin rich nutrients such as Vitamins A and E help in the protection and repair of cell membranes. They have the ability to renew skin to a healthier state and stimulate cells. A rare potent compound (Hydroxytyrosol) is also found in olive oil to be especially helpful in preventing free radical damage and it also has anti-inflammatory and anticoagulant( discourages artery clogging) properties. To receive the highest amount of antioxidant quantities, extra-virgin olive oil is particularly rich in these substances because it has not been refined, or industrially treated with heat or solvents during the processing. A very important part of any beauty regimen is exfoliating. It sloughs away dead cells while unclogging deep embedded dirt and oil. It will help with blood circulation and leave your skin smooth and glowing. There are many various commercial products on the market or you can try making your own homemade scrub. Try this olive oil on skin treatment. It stimulates cell turnover, renews, and unveils fresher looking tissue. Your morning brewed coffee grounds can be used for a natural exfoliant. A very easy mixture of equal parts ground coffee and olive oil blended together can be applied to your face or body. Gently rub it onto you skin with your fingers in circular motions. Rinse well with warm water, Pat dry. It’s no secret that olive oil has succesfully been used for centuries for personal beauty care. Quality olive oil contains high amounts of oleic acid which is great for adding moisture,softening the skin, and keeping it supple. Its emollient properties are especially beneficial for sensitive or dry skin types to soften tissue, lubricate and moisturize. It provides an extra moisture shield that helps assist mature skin types to help reduce the effects of aging such as fine lines and wrinkles. The oil cleansing method is a technique using natural oils to cleanse and dissolve trapped oil and makeup. Olive oil with a personal blend of Castor oil will deep clean and balance our skins own oil production at the same time. You will discover through trial and error what ratio is ideal for your own skin type and you can refine your own regimen. It is especially ideal for oily, acne types to help heal, protect, control and regulate oil production. The Castor oil is the main oil used for its strong drying and cleansing properties. It also has potent anti-inflammatory properties. Its main job is to draw out embedded oil, dirt, and toxins from the pores, cleanse, and dry up excess oil. Extra Virgin Olive Oil is used to help transport the Caster oil to deep clean the pores and bring debris to the surface. It helps dilute the very thick consistency of the Castor oil and restore the skins natural moisture balance. The rich antioxidant properties add nourishment. An oil cleanser blend can be made up and stored in a convenient jar. Start with small batches until you find your perfect mixture. Pour a small amount into your palm of hand and rub hands together to warm oil. Apply to dry face, neck and décolleté and massage with fingertips slowly and firm across entire area. Continue to massage oil in, concentrating on any problem areas. Do not scrub- let product do the work. Prepare to steam face, neck, and décolleté to remove oil and impurities. Using a clean washcloth –Soak in very hot water, wring it out, and place open cloth on skin till cool. Wipe off oil gently with cloth. Repeat steam rinse if needed. 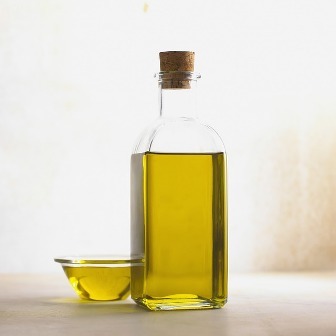 Give the olive oil method a chance-You’re on your way to a clearer, glowing complexion.